In Matthew 14, Peter stepped out of the boat and walked to meet Jesus in the midst of the waves. His faith enabled him to rise above the storm, as long as he kept his focus on the Savior. His brand-new book, Do the Impossible: Six Steps to Achieving Freedom Through Faith — This how-to guide will help you learn to cling to God not clarity, trust that God is for you, how to speak words of faith and encouragement over your life and others, and to have the courage to step out in faith, just like Peter. Do the Impossible: Six Steps to Achieving Freedom Through Faith six-message series on DVD — Based on Pastor Bobby’s sermon series, A Simple Guide to Walking on Water, learn how to practically put your faith in God, stepping out to do the impossible with Him. 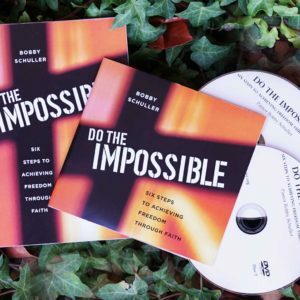 As you give today and begin to challenge “the impossible” in your life with God — a damaged relationship, financial challenge, or illness — you’ll be empowering many other broken and hurting people, all around the world through Hour of Power with Bobby Schuller, to put their faith in Jesus, as well! With God, we can scale the tallest and most daunting mountains in our lives, and we can walk on the water through the roughest storms. And, He will use us to do impossible and powerful things for His Kingdom.